In Matthew 26:27-29 our Lord Jesus spoke to his disciples about the communion cup. “(27) And he took the cup, and gave thanks, and gave it to them, saying, Drink ye all of it; (28) for this is my blood of the New Testament (Covenant) shed for many for the remission (forgiveness) of sins. (29) But I say unto you that I will not drink henceforth of the fruit of the vine until that day when I drink it new with you in my Father’s Kingdom” (Matthew 26:27-29, KJV). When we refer to the symbol “cup,” we actually refer to the contents of the cup, “the fruit of the vine” that Jesus passed to his disciples. On this occasion, that juice represented the life of Jesus — his human life, his being, his soul — poured out in sacrifice for the remission of sin. Grape juice is sometimes referred to as the “blood of grapes” (Genesis 49:11), and in this case it represented the blood of Jesus, shed for us. In Psalm 116:13 we read of “the cup of salvation.” We might readily connect this to the cup Jesus passed to his disciples at the last supper, for by receiving the ransom sacrifice of Jesus for us, we receive salvation. The world’s salvation shall be attained in the future, when the cup of salvation is then applied when they accept Christ by faith. Let us take a moment to try to understand some words in this Psalm. “The Death” of Christ’s body members (“his saints”) who are training for the Heavenly Priesthood of Christ during this Gospel Age (since the opening of the High calling in AD 33, from Pentecost) — is the process from the time of FULL consecration to our Heavenly Father’s service and our Heavenly Father’s ACCEPTANCE to His service. Once we are accepted — begotten of God’s Spirit — we become New Creatures IN Christ, and this is the way we are dealt with: consecration, dying daily, and finally the actual dying of the flesh. (See R5325). The Vow of Christ and his members is faithfulness unto death (Revelation 2:10) — the drinking of the cup. The promised reward for doing so is the crown of glory in the Kingdom. This is represented as another cup of the future. Only those who presently share with Christ in his cup of suffering, will share with him in the cup of joy and glory, which the Father will pour for the faithful at the end of this Age — at the close of this anti-typical Day of Atonement and its sacrifices. Our Lord used the symbol of “cup” also in in Matthew 20:22, when he answered James and John that their only hope of sitting with him in his throne lay in their partaking of his cup of suffering and sharing in his baptism — into death (1 Peter 4:13, Romans 6:3-8, 2 Timothy 2:11,12, Colossians 3:3, Galatians 3:27). When in the garden of Gethsemane Jesus prayed “if it be possible, let this cup pass from me: nevertheless not as I will, but as thou wilt” (Matthew 26:39), this was a cup of bitter experience. If we at times experience “a cup” of sorrow, as Jesus in Gethsemane, let us treat it as the greatest privilege and opportunity to prove our loyalty to our Heavenly Father in acquiescing to His divine and perfect will for us even in this. “While this wine of sacrifice exhausts the human nature, it invigorates and makes strong the spiritual nature” (R588:3) and no matter how trying is the cup of sorrow, “we know that ALL things [experiences] work together for good to them that love God, to them who are the called according to his purpose” (Romans 8:28). Both Christ and his followers have rejoiced in their tribulations, not counting their lives dear unto them, that they might win the great prize. We can rejoice in tribulation because of our hope in Christ which is founded upon the most precious promises of God (Hebrews 6:19, 2 Corinthians 3:12, Colossians 1:5, Romans 5:4, 2 Timothy 4:8, Philippians 3:11, 1 Corinthians 9:25, James 1:12, Romans 8:18). As the tribulations will overflow, the rejoicing likewise overflows, and with the Apostle Paul, we can say, “Rejoice in the Lord always; again I will say, rejoice!” (Philippians 4:4). When we commit our “cup” of any particular experience to the Lord, then we make a recognition that our cup of experience is the Lord’s. Through patient cheerful endurance in doing the Lord’s will — not rendering evil for evil nor slander for slander, but on the contrary, blessings in return for injuries (1 Peter 3:9) — may we continue to do all in our power to hold forth the Truth in its glorious beauty, so that not only its friends will be the more charmed and blessed, but that any of its enemies may be recovered from their folly. ♦ Our Lord’s death our Lord’s sacrifice of his earthly rights, which was sufficient of itself to have sealed the New Covenant (R4453:4). ♦ The shed blood of Christ which is our redemption to release us from the condemnation (of Adamic sin — from the curse/sentence of death, and thus) of justice (R3526:5) was the ransom price for all (1 Timothy 2:6). His act of handing the cup to his disciples and asking them to drink of it was an invitation to them to become partakers of his sufferings (R5192:5) and drink into Christ’s death, to “be made conformable unto his death” (Philippians 3:10). ♦ One cup, though it contains the juice of many grapes. It was Jesus’ cup of which he drank, which he gave to his disciples to finish (R4475:1). The grapes cannot maintain themselves as grapes if they would constitute the life-giving spirit (R5341:3, R2772:6). Thus they must be crushed. ♦ Our fellowship in the sufferings of Christ’s (2 Timothy 2:12), in Christ’s dishonor, pain, shame, degradation (loss of self-respect, mortification), bitterness, distress and sorrows (because of seeking after that which is Godly and righteous in God’s sight) until our mortal death (R3880:3, R1637:4, R5081, R4591). We rejoice in the privilege of sharing in the sufferings of Christ because of the glorious results (1 Peter 4:13, Romans 8:17, 2 Timothy 2:12). ♦ The antitype of the cup, in its highest sense, will be the new joys in the kingdom (R4703:6). Was the juice made from wine or unfermented grape juice? Nowhere is this cup described as wine, though it may have been (R2772:6) for (as shared in an article in the March-April 2018 Herald of Christ’s Kingdom Magazine (titled “Bread and Cup”) we read: “the vintage season in Palestine was September and October, and the Passover was about six months later. The wine made in October would of necessity be fermented before April.” If we suppose that Jesus used wine, we might feel compelled to copy the issue down to the actual drink he used, namely fermented grape juice, or wine. However, it is an open question whether it was fermented or unfermented. “We feel sure that unfermented grape juice will fulfill the terms of the injunction” (R3879:6). Our recommendation is against a general use of wine as being possibly a temptation to some weak in the flesh. It might not be amiss to put a small amount of fermented wine into the unfermented grape or raisin juice (R2773:4) as this then would not put any others into danger of stimulating an appetite they had tried to overcome. If any one should feel himself endangered by tasting wine at the remembrance of the Lord’s death, we would recommend that such a one use grape or raisin juice instead which, though not wine, is certainly a “fruit of the vine” (R509:5). Before Jesus gave the cup of the fruit of the vine to the twelve Apostles to drink, he gave thanks to the Heavenly Father. There is a lesson here for the consecrated people of God who willingly partake in the sufferings of Christ — that of remembering to joyfully acquiesce in all the sufferings which the breaking of the bread and the crushing of the grapes implied (R2773:2) and in doing so, display thankfulness and gratitude to the Heavenly Father for the privilege of being counted as worthy of running the race of the High calling in Christ Jesus to which such were called by God, and who then consecrated themselves to holy service, following in the footsteps of Christ Jesus. Matthew 26:27 (KJV) says, “And he took the cup, and gave thanks, and gave it to them, saying, ‘Drink ye all of it.’ ” The New American Standard Bible, and others, express this command from Jesus a little more clearly. “And when he had taken a cup and given thanks, he gave it to them, saying, ‘Drink from it, all of you.’ “ Jesus was not meaning to say “drink the entire content of what is in the cup,” but rather, Jesus was as if saying to the Apostles that all of them require the redemption that is in the blood of Christ. All of Jesus’ disciples need to drink from this cup. All of us require the redemption that is in the blood of Christ. “He that eateth my flesh, and drinketh my blood, dwelleth in me, and I in him” (John 6:56, KJV). During the present Gospel Age, those who are invited to receive this blessing are also called to walk in the way that Jesus walked, and join him in suffering in the present, for the hope of glory in the future. “We suffer with him, that we may be also glorified together” (Romans 8:17). As Jesus was fully committed to his consecration to God, we should be also. The consecrated children of God experience suffering with Christ now. We leave none of the sufferings for the coming age (R3880:2, R4605:3, R4453:4, R4429:4). Jesus Christ invited God’s called ones to participate with him in the sacrifice of EVERYTHING — earthly life, interests, hopes, aims, ambitions. All who will reign with Christ, must now drink of the cup of self-denial, of self-sacrifice, as Jesus did. We must be immersed into his death (R4591:5). Our participation in our Lord’s sufferings show not only our interest and gratefulness in Christ’s sacrifice, but also expressing our own (individual) covenant (agreement/promise) to be dead with him and to drink of the cup of experience that he received (R325:5). The appropriation of this by us signifies primarily our acceptance of restitution rights and privileges which our Lord has thus, at his own cost, secured for us (R2772:4). Christ’s blood was represented through the drinking of the symbolic one cup of the fruit of the vine and it represents our Lord Jesus’ human life, his being, his soul, poured out unto death on our behalf (R2772). As “blood maketh atonement for the soul” (Leviticus 17:11), so Christ sacrificed his life, shed his blood, gave his life, providing redemption for us and all. His death on Calvary’s cross was the final step in his labors to provide redemption for us now, and the world in the Kingdom. If we receive of his life for us presently, we are able also to lay down our lives in sacrifice with him. As Jesus’ sufferings prepared him to be our high priest, to purge us from sin, so our sufferings will prepare us to be with him in glory, to assist him in purging mankind from sin. The word “new” is missing in good manuscripts in Matthew 26:28, but it is included in Luke 22:20. By the words “new testament,” Christ was talking about the New Covenant, which supersedes the Law Covenant (R3364:5) and whereby through his shed blood at Calvary, the New Covenant would be sprinkled, sealed and made efficacious (R4331:6) just as Moses had ratified the Law Covenant (a shadow of this) with the blood of burnt offerings and peace offerings (Exodus 24:5-8). When Christ and his Church is complete in glory, at the end of the Gospel Age, then the blood of Christ will be applied for the world. Then Israel will see their privileges under a new covenant, replacing the old covenant, and become a means of extending the blessings of the Kingdom to the world. We were redeemed, not with Jesus’ example, but with the precious blood of Christ (1 Peter 1:19). Our sins could never have been forgiven by divine justice except through the divine arrangement by which Christ Jesus paid our penalty. the ransom price for the sins of the whole world. These words of Christ refer to the time the saints will join him in glory. During the present parousia, or presence, of Christ, those who have completed their service here below are being gathered into the joyous privileges above. Soon the Gospel Age of suffering will end, and all of the remaining members of the Bride class will join those who have gone before. During the Millennium thus introduced, the elect Bride class, the 144,000, shall be in heavenly glory, beyond the vail, in heaven itself. Seeking after immortality means desiring with one’s entire being to be raised in immortality (1 Corinthians 15:42) with a body and mind in which there can NEVER EVER be found sin or disobedience — where this is not possible or probable; where the tests of loyalty, obedience and faithfulness to God’s principles have been overcome and proven one as worthy to inherit life within one’s own self, not dependent on another for life and for purity, and where the Almighty Heavenly Father is honored above all (Revelation 14:1-5). The saints will receive the promise of eternal life in the Kingdom, and the grand JOY of participating with the Master in uplifting the world of mankind! To have the Heavenly Father receive JOY from ALL His creation, is a thrilling thought. It gives one a foretaste of SUBLIME PEACE, beyond tranquillity. It is beyond us to fully grasp what it will be like to not have to fear ever disobeying the Almighty Father! What a wonderfully grand thing to NEVER EVER have to fear causing the Heavenly Father pain, displeasure, or grief, when sinless everlastingly! This is the ultimate JOY that can be attained by any being, created in the image of God! ♦ feeling this PEACE OF GOD in a DIVINE body, with a perfected and DIVINE mind! ♦ a PAIN-FREE existence that brings the Ultimate Power of the Universe — Jehovah, the Heavenly Father (who’s divine love, justice, wisdom and power are beyond words), everlasting and righteous pleasure. ♦ an EVERLASTING state where causing unintentional pain, suffering, or injury is never possible! “(9) For our knowledge is imperfect, and so is our prophesying; (10) But when the perfect state of things is come, all that is imperfect will be brought to an end” (1 Corinthians 13:10, Weymouth New Testament). This kingdom of God will be experienced in the highest sense, beyond the antitypical second veil of the antitypical “tabernacle” in the presence of God Himself, by the overcomers of the Gospel Age who inherit everlasting life in the Divine Realm. As a result of the trials and sufferings endured, there will be a jubilation in the Kingdom and hence, Kingdom glory is the end of the symbol (R5193, R2272). Primarily it is the Kingdom of the Father, but the Father has voluntarily proposed to place the dominion of the earth for 1000 years under the full charge of a Viceroy, Christ and his bride (D642). The passover lamb spared only the firstborn of the Israelites. The anti-typical meaning of this would be that our Lord Jesus as the Lamb of God which “taketh away the sin of the world” (John 1:29) would spare or pass over only the Church of the firstborn ones in this Gospel Age, the antitype of the passover night. “Only the Church of the firstborn, the household of faith, the consecrated, are spared or passed over through Divine mercy, through the merit of Christ’s sacrifice, during this Gospel Age. Nevertheless, the divine plan does not end with the deliverance of “the Church of the firstborn whose names are written in heaven” [Hebrews 12:23] and who shall share with Christ in ‘his resurrection’—the first, or chief resurrection. The appropriation of the merit of Christ first to the Church is merely an incidental feature of the Divine Plan. Soon the Church shall have shared by the privilege now granted to believers of becoming dead with Christ to the earthly interests and alive as New Creatures by the first resurrection. Then the merit of the blood of Christ, the slain Lamb, will be applied to the world of mankind to legally ‘take away the sin of the world.’ When applied it will immediately satisfy Justice on the world’s behalf and turn over the world to the Redeemer for restitution blessings. Then the Lamb of God and the Church, ‘the Bride, the Lamb’s wife,’ will prosecute the work of actually taking away the sin of the world during the Millennium” (R4556). Br. David Rice — Some content and editing. The large majority of the “Watch Tower” articles which have been referred to in this post, have been written by Br. 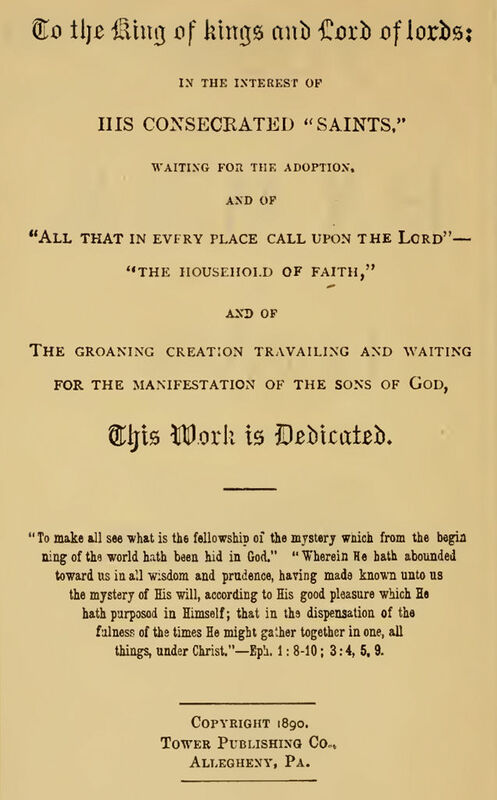 Charles Taze Russell — the Laodicean (7th Church Period) Messenger of the Book of Revelation. “Are We Actual Or Reckoned New Creatures?” The Reprints (No. 5325) of the Original Watch Tower and Herald of Christ Second Presence. “The Ransom.” by Br. David Rice. Faithbuilders Fellowship Journal. “Bread and Cup” by Br. James Parkinson. The Herald of Christ’s Kingdom Magazine, March-April 2018.